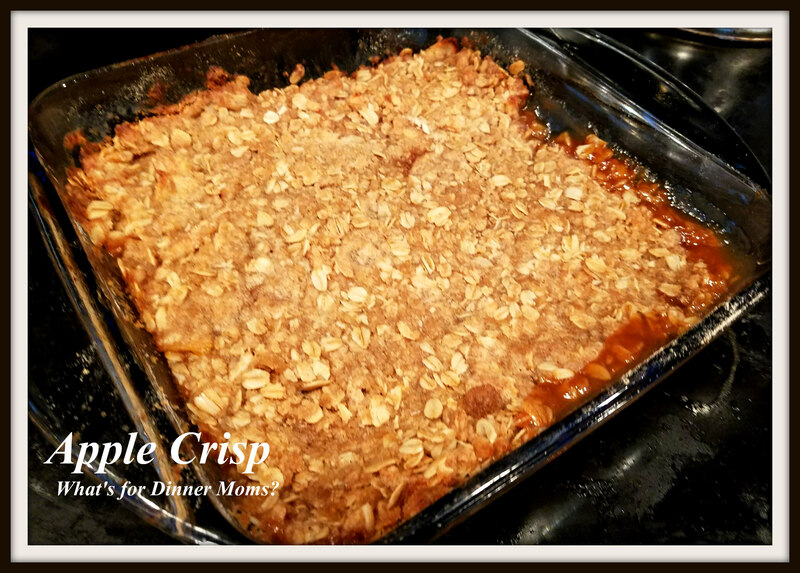 Apple Crisp – What's for Dinner Moms? 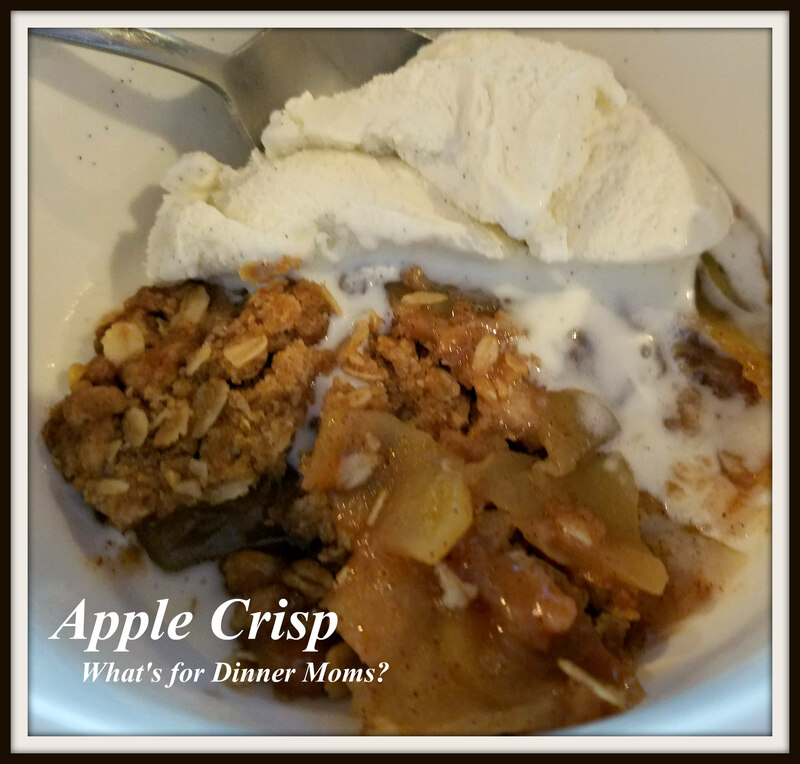 We wanted a warm comforting dessert the other night and Apple Crisp with Vanilla Ice Cream sounded so good. I wanted lots of crispy crust on top and the apples to be sweet but not cloyingly sweet. I think they licked the pan clean! Everyone kept saying how good this was. The apples were not overly sweet but had a good cinnamon flavor. They crust was crispy and flavorful too. It was so good warm with the vanilla ice cream melting over the top. Preheat oven to 375 degrees. Butter an 8 by 8 inch baking dish. In a mixing bowl whisk together 1/2 cup flour, the oats, 1/2 cup brown sugar, the baking powder, 1/4 tsp cinnamon and 1/4 tsp salt. Add diced butter to bowl and rub butter into dry mixture until it comes together into small crumbles. Transfer to refrigerator to chill while preparing filling. In a large mixing bowl, whisk together melted butter and flour until well blended, then mix in water, lemon juice and vanilla. Stir in 1/4 cup brown sugar, 1/2 tsp cinnamon, and pinch of salt. Add peeled and sliced apples to the bowl and toss gently. Pour apple mixture into prepared baking dish and spread into an even layer. Remove topping from refrigerator and sprinkle into crumbles evenly over top of apples. Bake until top is golden brown and apples are tender when pierced with a toothpick, about 35 minutes. Remove from oven and allow to rest 10 minutes before serving. Serve warm with vanilla ice cream. I live great family memories from foods! Sounds exactly what I love too! Btw. I made your Sloppy Joe recipe today and we loved it!! Thank you! I am so very pleased you liked it! I am such a nervous nellie putting things out there. Thank you!! Oh, there is absolutely no need to be nervous about it. I have printed quite some recipes already and the ones I checked out worked wonderfully! Thank you for sharing your recipes, Marci!! Thank you so much for the confidence boost, Erika! Another tasty dish, and I love apples. Also tried your Sloppy Joe recipe, and it was a hit! My family love apple puddings, Marci. I am definitely trying this recipe. I love apples especially the ones from the Pacific Northwest. So, will try this out!! I have been wanting apple crisp. Making this right now! I’m so grateful for this and your other great recipes. I had tons of them but all of them, and my cookbooks, were lost. So happy to be able to come to your blog and find so many good replacements! Thank you! So, sorry for the loss of all your treasures. I have the recipe cards from my mother and grandmother and they are such a treasure to me I cannot imagine the pain of losing them. But, glad I can help a bit in rebuilding your recipe stash. Nicely done! Apples and ice cream bring back memories! Thank you.